Proven techniques for resolving workplace conflicts After years of seeing clients struggling and their businesses suffering with destructive conflicts, Diane Katz developed The Working Circle, a step-by-step process that helps everyone in business resolve conflict in a non-confrontational, creative, collaborative way. Win at Work! provides you with a no-nonsense guide based on real-life examples of people at pivotal points in their careers. Filled with practical wisdom, it reveals how you can move around the roadblocks that, if left unattanded, can stop you in your tracks. Win at Work! also helps those of us who are uncomfortable with conflict, giving them tools for solving problems in a nonconfrontational manner. 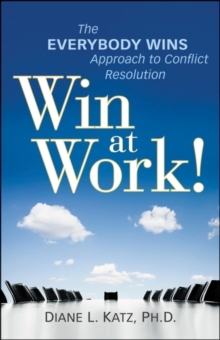 This essential guide * Offers a proven step-by-step process for conflict resolution * Deals with complex business questions about independence, moral values, face-saving, goal-setting, and leadership * Provides easy language for talking through problems and reaching a relatively painless outcome Putting aside simple band-aid solutions, Win at Work! is your proven resource for the kind of long-term team-building that ultimately makes the difference in business and organizational success.